Few people like clearing snow, but it’s a must to keep sidewalks and driveways safe and passable. 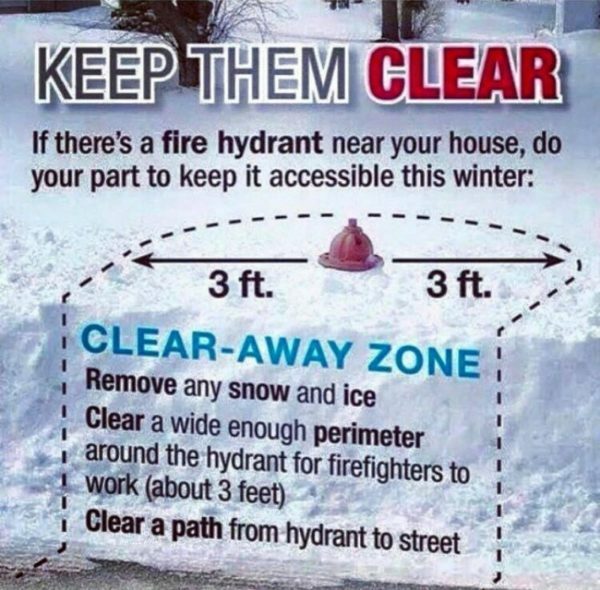 While many of us focus just on clearing a space for our car and the area in front of our residence, please don’t forget something else that’s just as important, but often overlooked: the area around hydrants. It’s a critical task. Think about it: if emergency workers need access to water to battle a blaze, seconds count. Time they’ve wasted shoveling out a fire hydrant so they can connect a hose is time they could have used to save a life or a home — possibly yours. Clear a path for meter readers: Utility companies occasionally need to check your electric, gas or water meter. They’ve likely spent the day trudging through snow and ice – don’t make their jobs harder. Be sure your sidewalks are clean and salted. If yours aren’t properly cleared, you could face fines or be held liable if someone is injured. Check your municipality’s ordinances to find out what you’re responsible for maintaining. Whether you’re cleaning off the sidewalk or making a space for your car, don’t shovel the snow into the street. Finally, be safe when you’re out shoveling. Check out a page from the National Safety Council for some tips that could save your back — or your life.